Dr. Edsel Holden is board certified in Pulmonary Disease, Internal Medicine, as well as in Critical Care Medicine, with a medical practice experience of nearly 30 years. 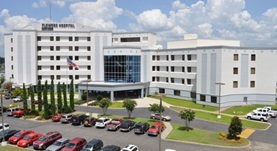 He graduated from the University of South Alabama College of Medicine and did an internship at the Vanderbilt University, where he also completed his residency. A fellowship training program followed, at the previously mentioned university. Dr. Holden received the Patients’ Choice Award by Vitals Patients Choice in 2008, 2009 and 2011 in recognition of his competence and professionalism. He was nominated by his patients as one of the top 10 experts in his field within the state of Alabama in 2014 as well. At the time, Dr. Edsel Holden practices at Flowers Hospital in Alabama.